In a previous post last December, I had a quick look at the valuations of a few Chinese internet stocks that are traded in the US, solely for curiosity’s sake. At that time, I mused that Google (GOOG) may be a better bet than any of the Chinese high growth/high risk plays given its valuation. The one maybe I highlighted amongst the Chinese internet stocks was Baidu (BIDU), the so called Chinese Google. It is somewhat ironic that BIDU today fell 15% after disappointing results from higher expenses and lower revenue projections whilst GOOG, which had a great quarter due to revenue growth and squeezed expenses, is up over 20% since its Q2 results. Just shows what I know! 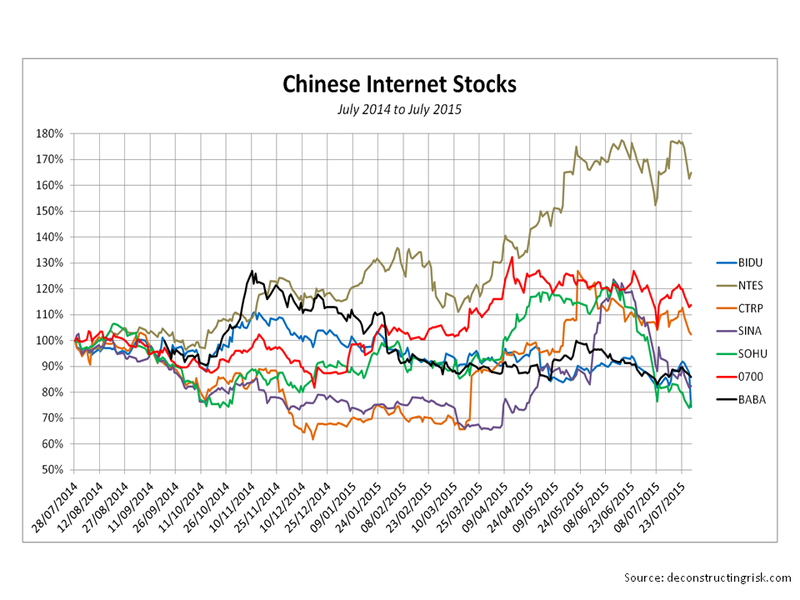 Given the drama in the Chinese stock market, I had another quick look over the Chinese internet stocks to see how they are performing, as per the graph below. It is far too early to tell what the impact of the current turmoil will have on the Chinese consumer and on the Chinese internet sector (if any, given the government’s current policy of propping up the market). At this stage, it is interesting to see that it’s NetEase, primarily in the online game services sector, which has stood up the best so far, up 40% this year. That just confirms to me how far these stocks are outside my comfort zone.